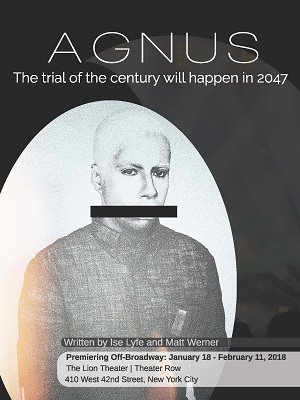 In Ise Lyfe and Matt Werner’s new play Agnus, everything about 2047 feels unnervingly familiar. A soothing artificial intelligence called “Sequoyah” relays information upon command, screen-obsessed citizens are stirred into fervors by corporate media sensationalism, privately run prisons become breeding grounds for unethical behavior and the government seeks ways to control both the content and distribution of information to the public. Plausible and uncomfortable, Agnus is billed as a political theatre drama and finds strength in its political voice, espousing unnerving plausible truths about the ways in which current technology, social behavior and political ideology could evolve into a future where truth has little meaning. However, these important themes are sometimes lost in Agnus’ unfocused plot that simultaneously tries to do too much without addressing key points of intrigue that drive the show to its explosive conclusion. Agnus Eli is an enigma. When psychologist Dr. Richard Bo is first introduced to the cuffed man, tufts of blonde hair peeking out from beneath a Bane-esq face mask that conceals Agnus’ unpigmented skin, Agnus sits quietly with the knowledge the he has been charged with murdering the Governor of California. Dr. Bo is tasked with determining the inmate’s sanity while he is housed on a secret floating barge off the coast. Throughout their sessions, Agnus opens up to Dr. Bo, discussing childhood traumas resulting from his unusual appearance, his time at MIT where he was engaging in botanical innovation and his embrace of anti-government politics after a friend, Monet Wu, dares to vocally challenge a politician face to face. As Dr. Bo becomes confident in Agnus’ sanity, he also begins to question Agnus’ culpability in the crime for which he is accused. The high profile nature of the Agnus Eli case and the questionable conditions under which he is held result in a steady uprising against Agnus’ treatment by the U.S. government, the prison officials and the police and, as all cameras are focused on his trial, key revelations threaten to unravel the case against Agnus Eli. Unfortunately, the facts may not matter when weighed by a kangaroo court that seems determined to condemn Agnus Eli regardless of his possible innocence. Agnus proves to be an intriguing concept play where explorations of political, ethical and technological themes are connected through the tale of Agnus Eli – a mysterious man accused of murder. The vast injustices perpetrated in the United States prison system take center stage as Agnus faces brutal treatment at the hands of the prison guards and finds his rights often under attack in the secret offshore prison where the U.S. government has housed him. The few legal protections afforded to Agnus, such as his meetings with Dr. Bo to determine his ability to stand trial, are manipulated into mechanisms to be used against him in court (despite the mitigating evidence that is brought to light because of these protections). His appointed counsel smacks of incompetence, the judge delivers remarks directly into the media lens and the only people who can speak in Eli’s defense are silenced. Sadly, these barriers to justice are too often found in modern courtrooms as well. The technological means that facilitate this fictional courtroom charade, including a computer (e.g., cell phone, tablet, smartwatch) in every person’s hands at all times, constitute advances that make life less complicated but also surprisingly empty at times, driving the masses to the Agnus Eli trial like vultures circling prey. Where Agnus comes up short is in the narrative itself. Agnus Eli proves an unmistakably engrossing character – an outsider whose thinking and motivations are perplexing and fluid. He is a man who shuns technology and lives off the grid until he is captured and incarcerated in the very center of it. Yet, when it comes to the climactic revelations of Eli’s past, the disclosures feel rushed and inorganic. In particular, when Eli’s connection to the murdered Governor comes to light, the declaration seems almost ancillary to the plot – a development revealed too late in the action for it to much matter at all. Alluring plot points such as Eli’s relationship with Monet, his botanical development work and his final actions in court never fully develop, leaving more questions than answers – is Eli an ingenious leader with followers or a follower hiding from life’s difficulties? What precisely was Eli developing out on his farm? Did he actually engage in anti-government action? Does he have a cause or is he simply a man caught up in unfortunate circumstances? Despite the play’s long runtime, these questions mount quickly. The creative team, led by Director Nelson Eusebio III, makes the most of the intimate Lion Theatre, using staging techniques, lighting and projection design to make the production feel grand and evocative. The jail that houses Eli features appropriately harsh lighting designed by Jeanette Oi-Suk Yew, with the lighting evoking a sense that the subjects are constantly standing in the glare of a scrutinizing camera lens. Ian McClain’s projections give the set a futuristic vibe and creatively provide a narrative of what is happening outside the walls of the prison. Working within this environment is an ensemble of actors, a number of whom give standout performances. For example, Kiran Rhe’s calming cadence as the electronic voice Sequoyah nicely mimics the artificial tones of Siri and Alexa, which the world has grown accustomed to in daily life. H. Foley adds some much needed levity as Detective Douglas Seals, delivering sharply timed punchlines and conveying an exasperated oafishness to counter Brian Lee Burke’s more clinical delivery as Dr. Bo. Cedrice Webber shines as Monet Wu, crafting Monet with a fierce mysteriousness that makes the character both alluring and capable of confronting the establishment. Ise Lyfe also provides moments of quiet insight and discomfort as Agnus Eli, although there are times when Lyfe’s mannerisms and reactions do not quite align with the emotion driving certain scenes. Ultimately, Agnus could you the creative hand of an editor – there are elements of brilliance tucked away in an ambitious script and characters worth exploring in greater depth, but these elements are intertwined with a story that often feels both unfinished and unfulfilling. Agnus runs until February 11, 2018 at the Lion Theatre in New York City.